It’s a difficult one Paul and as you say none of us believe that it (an accident) will happen to us and also I can understand that for these guys and others like them any precious monies earned they don’t want to pay out on transport to get to and from their job…don’t know the answer! I also made some photos because I was sure that no one back home would believe it without a photographic proof. Btw: I was also very surprised how much South Africans fit in a car. But how the hell is it possible to squeeze 102 kids in a 18-seater? I’ve also mentioned the story in my blog, added the notice that I’m reluctant believing this story even if it’s given out by the City of Cape Town. I guess that’s exactly the point and the problem Bev. As you say – it’s difficult. Ali, perhaps they were going a record in the Guinness Book of World Records? While that may be amusing, I guess it’s no joke at all. I have no idea how that was possible – but I’m glad that the cops caught them! I often see parents driving with kids on their laps – or else the kids standing on the front seat… it makes me mad as a hatter. Some people simply have no clue. I also saw kids, who stand on the front seat. Very often, the irresponsible parents also phoned during the driving. I hope the people will pay more attention to security matters asap. If safety is the problem, I think it is safer riding on the back of a truck then in a mini bus! It’s a bit of a generalisation Jan, but you have a point there. 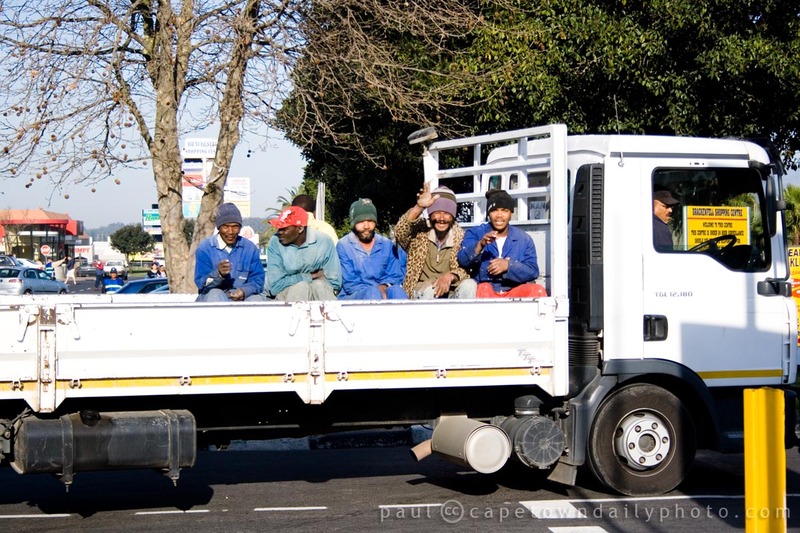 I’m sure all South African’s have seen their fair share of terrible driving practices along with overloaded minibuses.